Researchers at the University of California, Berkeley, have turned a benign virus into an engineering tool for assembling structures that mimic collagen, one of the most important structural proteins in nature. The process they developed could eventually be used to manufacture materials with tunable optical, biomedical and mechanical properties. The researchers, led by Seung-Wuk Lee, UC Berkeley associate professor of bioengineering and faculty scientist at Lawrence Berkeley National Laboratory (LBNL), describe their "self-templating material assembly" process in the Oct. 20 issue of the journal Nature. "We took our inspiration from nature," said Lee. "Nature has a unique ability to create functional materials from very basic building blocks. We found a way to mimic the formation of diverse, complex structures from helical macromolecules, such as collagen, chitin and cellulose, which are the primary building blocks for a wide array of functional materials in animals and plants." The blue-faced Mandrill (Mandrillus sphinx), for instance, derives its coloring not from pigment, but from the specific scattering of light formed when thin fibers of collagen are bundled, twisted and layered in its skin. In contrast, aligning collagen in a perpendicular, grid-like pattern creates transparency, and is the basis of corneal tissue. And corkscrew-shaped fibers, mineralized after interacting with calcium and phosphate, can generate the hardest parts of our body: bones and teeth. "The basic building block for all of these functional materials  corneas, skin and teeth  is exactly the same. It's collagen," said Lee. "I was mesmerized when I saw the brilliant skin color and sharp teeth of blue-faced monkeys at the San Francisco Zoo. It is stunning that the way the collagen fibers are aligned, twisted and shaped determine their optical and mechanical functions. What had not been well understood, however, is how such a simple building block can create such complicated structures with diverse functions." The researchers began by studying the factors influencing the formation of hierarchical structures. "We noticed how collagen is secreted in confined spaces, and how its assembly into tissues can be influenced by its environment," said study lead author Woo-Jae Chung, a post-doctoral researcher in Lee's lab. "Unfortunately, collagen is a difficult material to study because it is hard to tune its physical and chemical structures. We needed a convenient model system to solve this problem." That system was a soup of saline solution containing varying concentrations of a common bacteria-attacking virus, the M13 bacteriophage. The researchers chose the M13 virus  harmless to humans and a model organism in research labs  because its long, "chopstick-like" shape with a helical groove on its surface closely resembles collagen fibers. The technique the scientists developed entails dipping a flat sheet of glass into the viral bath, then slowly pulling it out at precise speeds. The sheet emerges with a fresh film of viruses attached to it. At a pulling rate ranging from 10-100 micrometers per minute, it could take 1-10 hours for an entire sheet to be processed. By adjusting the concentration of viruses in the solution and the speed with which the glass is pulled, the researchers could control the liquid's viscosity, surface tension, and rate of evaporation during the film growth process. Those factors determined the type of pattern formed by the viruses. The researchers created three distinct film patterns using this technique. With a relatively low viral concentration of up to 1.5 milligrams per milliliter, regularly spaced bands containing filaments oriented at 90 degree angles to each other were formed. With a slower pulling rate came increased physical constraints to the movement and orientation of the viruses. The viruses spontaneously bunched together, and as they stuck to the sheet, they started to twist into helical ribbons, much like curled ribbon used for gift wrap. The most complex pattern  described as "ramen-noodle-like" by the researchers  was formed using viral concentrations ranging from 4-6 milligrams per milliliter. By using the Advanced Light Source at LBNL, the researchers discovered that this highly ordered structure could bend light like a prism in ways never before observed in nature or other engineered materials. "We can determine the type of structure we get through this technique by fine-tuning the factors that influence the kinetics and thermodynamics of the assembly process," said Chung. "We can control the levels of order, direction of the twist, as well as the width, height and spacing of the film patterns." The researchers further showed that the virus assembly process could be used in biomedical applications. They genetically engineered the virus to express specific peptides, which influence the growth of soft and hard tissue. They used the resulting viral films as tissue-guiding templates for the biomineralization of calcium phosphate, forming a tooth-enamel like composite that in the future could be applied as a regenerative tissue material. The simplicity of the technique bodes well for adapting it for use in manufacturing, the researchers said. Once the parameters are set, it is possible to step aside and let the self-assembly process take place. "We let this run overnight, and by the next morning there were trillions of viral filaments arranged in patterns on our substrate," said Lee. "One of the most important aspects of our work is that we have started to understand nature's approach to creating such complex structures, and we have developed an easy way to mimic and even extend it." - better eyes, with more spectrum. i geuss i want to be a freak. Seriously, tho - this is brilliant and epic research. With incredibly far reaching implications. This is pretty good news. 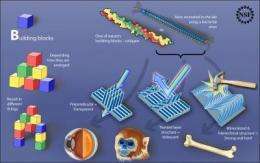 Opens up the door to manufacture real functional cartilage. E.g. in arthritis we currently have no way to replenish damaged cartilage. All we can do is take a biopsy sample and grow a lump of cartilage and then reinsert it. But the cartilage in joints has a very definite 3D structure (parallel at the bone, orthogonal in the intermediate layer and parallel again where it contacts the cartilage from the bone on the other side) - so the biomechanical properties are entirely different from an undifferentiated lump of cartilage cells.